Victorians had great interest in sea creatures and the well to do often displayed their aguatic collections in elaborate fish tanks and went to great lengths to keep them properly stocked as described in this article. What is there about a fountain’s allure that entices the rushing passerby to slow down and linger, the world weary soul to seek out its comfort, and intrigues even the local wildlife? While it’s harder to quantify the almost mystical appeal, it’s not so difficult to document that fountains have held a special attraction throughout history. An ancient stone fountain from 2000 BC is one of the earliest artifacts demonstrating success in controlling water for more than practical purposes. Advancements in hydraulics enabled Renaissance artists to “sculpt” water itself as it surged from grand fountains dominating European plazas and palace gardens. But it was the Victorians whoAntique garden fountain by Mott extolled fountains for their outright health benefits and also downsized them for more intimate pleasures, small enough to even fit into parlors. “It was all about health in the 19th century,” notes Sara Cedar Miller, historian and photographer for the New York Central Park Conservancy. In fact, “the first fountain in City Hall Park celebrated the Croton Water system that made New York City healthy.” Through massive reservoirs and aqueduct systems constructed in the 1800’s, growing populations in urban centers throughout the United States began to thrive from the benefits of clean water. Perhaps the most iconic fountain dedicated to water as a healing agent is in NYC’s Central Park. American sculptor Emma Stebbins unveiled her bronze Bethesda Fountain towering over the park terrace in 1873, equating its arrival of “pure wholesome water” to an angel’s visit. The Angel of the Waters, as the fountain is more familiarly known, is a monumental figure whose feet barely seem to touch the rocks from which water springs, and whose right hand reaches out to bless with good health those standing below. Is it any coincidence that Race for the Cure (a nationally sponsored event for breast cancer awareness) passes this fountain annually? Today, tap water’s purity is common enough without warranting an ironworks fanfare beyond a faucet, but fountains retain their association with good health for reasons resonating from the past. There is something within the human spirit that becomes refreshed in a fountain’s presence. As the waters trickle, dance, splash, defy gravity in plumes that fall into cascades, a peacefulness washes away anxieties, engaging the beholder in a most primal delight. Depending on the volume of its rush, a landscape of water can literally drown out unpleasant ambient sounds. As irresistible as flowers to butterflies, a fountain invites passing songbirds to perch nearby and harmonize with the music of falling water. Today, a fountain can be a prescription for healing a psyche stressed by the troubles of modern times. The owners of a Queen Anne house on Long Island invested in one such fountain-as-tranquilizer. Found in a condition that teamed extreme neglect with considerable damage, the antique fountain was repaired, repatinated, refitted with plumbing hardware and finally restored to completion with an antique basin. Installed on the side of their yard, the fountain transmuted the small area into the grandeur of a villa. For him, the fountain is a time portal allowing his eyes and ears to experience the exact same sensory details that Victorians did. For her, the fountain’s restoration has returned the favor by restoring her spirits with its soothing serenity. JW Fiske fountainResearching their fountain, the couple found that it is “Dolphin and Figure No. 5” manufactured by J.W. Fiske Iron Works. Further investigation yielded a fascinating history and yet another reason why an antique can offer more than a reproduction or new fabrication. “Beauty, creativity, design, quality, investment, aesthetics, our heritage -- it’s what I’m all about,” explains Joan Bogart of Joan Bogart Antiques specializing in fine garden and interior antiques. Joan Bogart, too, has done her research and relishes telling the stories of the prior “lives” of some of the pieces she offers for sale. 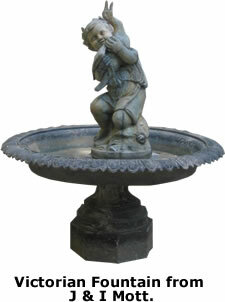 For example, standing at five feet tall, the signed “Boy and Boot Fountain” (also a Fiske with its original frog and turtle basin) came from the center of a village owned entirely by a single gentleman. Her documented fountains speak in peaceful flowing tones to knowledgeable collectors, some of whom rely on her expertise in referring a landscaper to assist in installation, others preferring the DIY approach. Shirley Hibberd, the leading gardening author of his day, gave his 19th century readers practical advice that applies to present day readers: place the fountain where trees are not apt to shed their leaves into the basin, where there is or can be planted “the grace of accompanying vegetation,” and where viewing the fountain can be maximally appreciated.